The legend of the three living and the three dead most probably comes from France. The oldest manuscripts go back to the 13th century: they contain poems of Baudoin de Condé, of Nicolas de Margival and of two unknown writers. 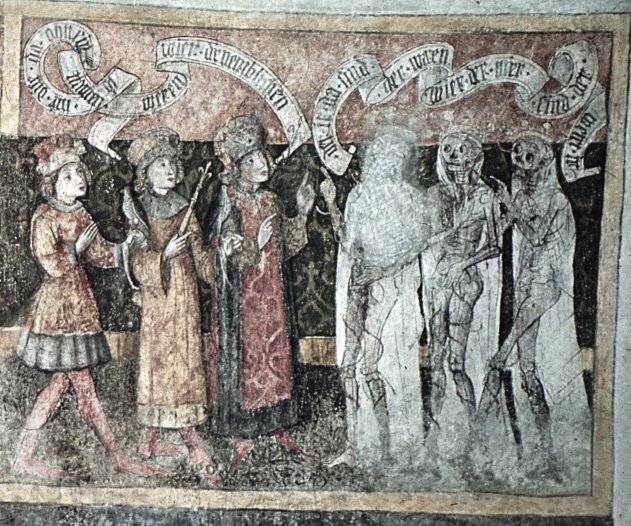 The plot of "the legend" is rather simple: three corpses (representing ecclesiastics) meet with three living (a duke, a count, and a prince). The latter are terrified by this encounter. The dead speak to the three rich men, urging them to repent: "Such as I was you are, and such as I am you will be. Wealth, honor and power are of no value at the hour of your death.". Condé's poem is illustrated by a miniature. In his version, the living travel by foot. 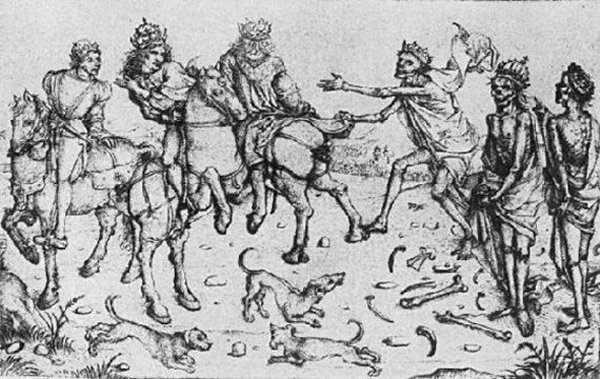 In the Master of the Book of Reason's, painted at the end of the 15th century, they are riding horses and ready to go hunting. Their frightened dogs surround them. The dead do not seem to be members of the clergy, but rather the doubles of the three living. 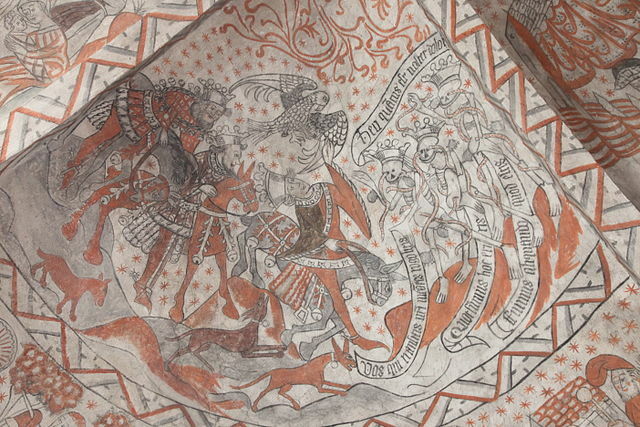 "The legend" was often painted al fresco in churches to accompany a dance of death, as in Paris, Meslay-le-Grenet, Kermaria, La Ferté-Loupière, although it sometimes stands by itself, as in: Sempach(1300-1310, Switzerland), Bregninge (vers 1400, Denmark)***, Überlingen (vers 1424, Germany), Tuse (1450-1475, Denmark)*** It is worth noticing that we do not know any poems or pictural representations of this theme past the 16th century. It is obvious that "the legend" has similarities with the dance of death; however, the former cannot be seen as the latter's direct precursor. In both genres, there is a dialogue between the living and the dead, as well as a division into social classes. On the other side, the dance of death has often more than twenty characters, whereas "the legend" has only three. On one didactical point, the two genres are alike: both use the contrast between the magnificence of the living, who are rich and noble, and the horror of the rotting corpses to show that even the mightiest of men must die. Rich and poor are equal in death. However, there is a significant discrepancy in the philosophy of the two genres. In the dance of death, the bell has already tolled and all people must join the dance: it is too late to repent. 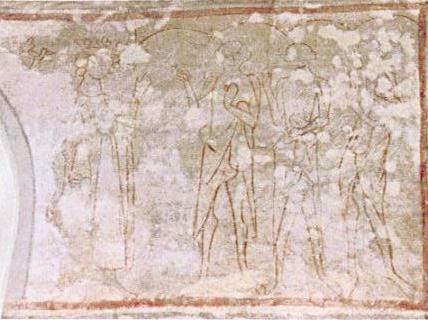 But in "the legend", the dead try to persuade the living to repent. Notice also that dance, under any form, never appears in "the legend". Thanks to Mr. Axel Bolvig for the pictures of Bregninge and Tuse. 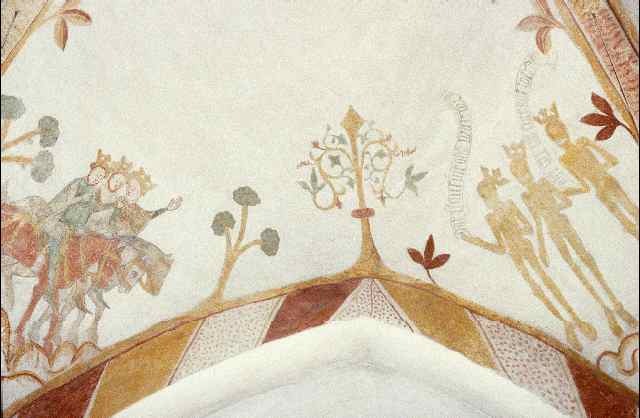 Those are Danish frescos that appear on his site.